Who hasn’t heard of Mount Everest, the highest mountain on planet Earth?! When you’re trekking in the Everest region (Khumbu region) you can see not just one, but four of the ten highest peaks in the world! Lhotse (8,516m/27,940ft), Makalu (8,485m/27,838ft) and Cho Oyu (8,188m/26,864ft), among many other towering, snow covered peaks. 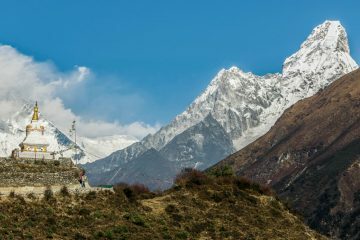 The Everest region has so much to offer, including the world’s most famous trek – to Everest Base Camp. Access to the Sagarmatha National Park, home of Mount Everest, is from Lukla. Take a stunning scenic flight right into the heart of the mountains. Land at an altitude of 2,860m/9,383ft at the Tenzing-Hillary airport. Trek through some of the most dramatic scenery on Earth. Nature is definitely the boss in this incredible part of the world! But it’s not the only reason to trek in the Everest region. Experience the beautiful Sherpa culture in its many different forms. Mountain city Namche Bazaar truly is a bazaar where you can find everything for trekking, and much more. The Sherpa’s spiritual hub at Tengboche, Dawa Choling Gompa, is a beautiful Tibetan Buddhist monastery. Made even grander by the magnificent view of Everest seen from its grounds. Around every corner, you’ll see something amazing in the Everest region. 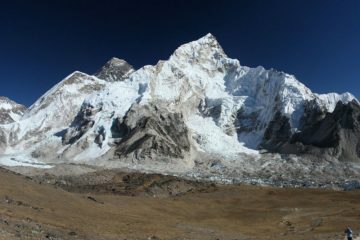 Whether you want to trek up to Base Camp and climb Kala Patthar (5,545m/18,192ft) for the very best view of Everest. Or make your own pilgrimage to Tengboche and wake up to spectacular views of Everest as the sun rises. We’ve got you covered! Have you always dreamed of hiking to the base camp of the world’s highest mountain – Mount Everest? Well now you can, and we promise that your trek with us will be all that you dreamed of! Trekking to Everest Base Camp is every bit as wonderful and amazing as you might imagine. From start to finish, this trek is packed full of adventure and the stunning natural beauty will stay in your memory forever! You’ll discover new levels of personal endurance and accomplish feats you never thought possible. You’ll experience the fun and laid back culture of the Sherpa. Come face to face with working yaks, and you’ll visit spiritual places that will deepen your self reflection. If you’re seeking pure wonder, this trek is for you! 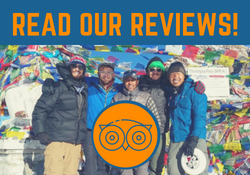 If you’ve been thinking about trekking in the Nepal Himalaya, you’ll likely have Mount Everest – the highest mountain in the world on your mind! At a staggering 8,848m/29,029ft, Mount Everest conquers them all. Yet it’s not as inaccessible as you might think! You can trek in the magnificent Everest region and enjoy amazing views of Mount Everest, without trekking as far as Everest Base Camp. On this awe-inspiring Everest Panorama View trek, we walk to the village of Tengboche. Home to an impressive Tibetan Buddhist monastery of the Sherpa community, Dawa Choling Gompa. From Tengboche, lose yourself in the incredible panoramic beauty of the Himalayan giants. You’ll have great views of Mount Everest, but that’s not all! You’ll see the fourth highest mountain Lhotse (8,516m/27,940ft)! Also Nuptse (7,861m/25,791ft), Taboche (6,495m/21,309ft), Thamserku (6,623m/21,729ft) and beautiful Ama Dablam (6,812m/22,349ft). There are many other options for trekking in the Everest region of Nepal. We guide several treks including Everest Base Camp via Gokyo and the magnificent Cho La Pass. You can even walk into Sagarmatha National Park from Jiri or Shivalaya instead of flying to Lukla. This beautiful walk adds up to seven days to your trek and is fantastic for your acclimatisation. Tell us what you’ve got in mind and we’ll work with you to build your perfect itinerary!